In anticipation of the frenzied mob of fans likely to storm comic book stores everywhere for issue #2 of the hit new series, Image Comics is pleased to announce that the digital edition of Warren Ellis (SUPREME: BLUE ROSE, Planetary) and Jason Howard’s TREES #1 will be available for free, across all platforms, starting today, Friday, June 20 through Tuesday, June 24. 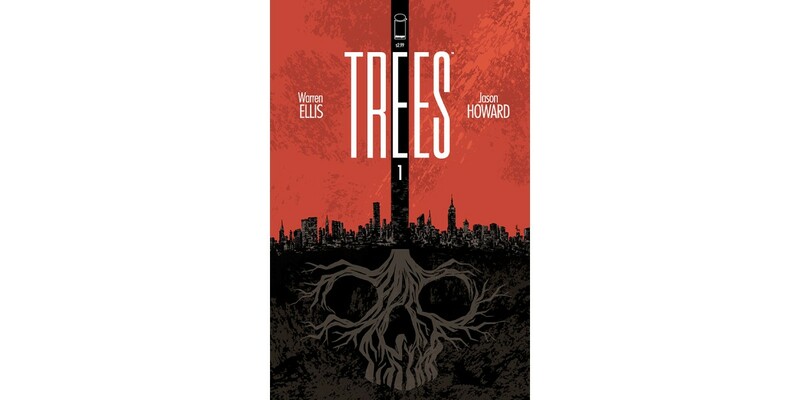 “It’s not every day that a writer as important and influential as Warren Ellis launches a major new series, so making sure Trees reaches as many readers as possible is an ongoing priority for us here at Image,” said Eric Stephenson, Publisher at Image Comics. “We started off by doing a massive overprint to make sure the book would remain in print over the course of the first few issues—we overprinted by one third of total orders—and now, based on not just incredible post-release sales, but near-unanimous praise, we are sharing the first issue with straggling non-believers for free. “Modern comics would not be what they are today without Warren Ellis, it’s as simple as that. Transmetropolitan. Planetary. The Authority. There are a fair number of writers working at Image today who could rightly be described as heirs to his creative legacy, but Warren is still at the peak of his powers and Trees is a glowing testament as to why. Readers who haven’t yet had a chance to jump on with the new science fiction suspense series everyone has been raving about will find the perfect opportunity to do so in this free TREES #1 promotion, available just before the second issue’s release. The free digital edition of TREES #1 will be available on the Image Comics website (imagecomics.com) and the official Image Comics iOS app, as well as on Comixology on the web (comixology.com), iOS, Android, and Google Play. TREES #2 can be pre-ordered using Diamond Code APR140611.